Congratulations to our friends Brian Connell & Tony Doyle (of House of Brews and Bourbon Street) and their partners on their newest venture: New York Beer Company. I got a sneak peak earlier this month when they were under construction (see details here). They will have some unique features, such as a New York-centric beer list. They are going to have 40 lines with 30 different products. Seventy five percent of the drafts will be locally brewed. Over half of their 60 different bottles/cans will be locally brewed. A percentage of the beer will be sold on a supply and demand basis. The more they sell of these featured beers, the higher the price will go. Specialized software will monitor sales at the point of purchase, and at any given moment, the may be a “market crash”, where the prices drops to a deeply discounted price. 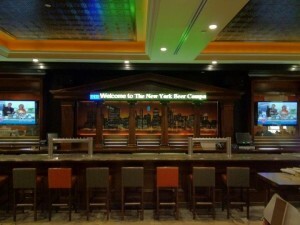 An LED screen above the bar will show the fluctuating beer prices on a ticker above the granite bar top, with New York scenery behind the bar. The mahogany columns are meant to mimic the columns of the New York Stock Exchange. 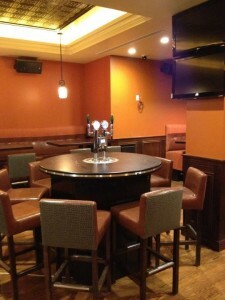 2 large draft tables will enable customers to pour their own pint at their seat via built-in beer taps. Join their facebook page for more updates.